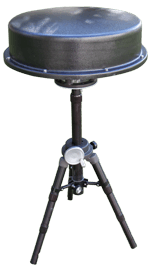 Antennas - Tech Comm, Inc.
Tech Comm, Inc., designs and manufactures a variety of Radio Direction Finder antennas, interoperable with all models of Radio Direction Finder Processors manufactured by Tech Comm, Inc. 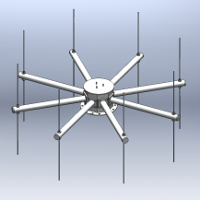 Custom designs, application and mission specific designs are available, in addition to the standard antennas models described below. Several of the classical designs are suitable for both overt and covert installation in airborne, shipboard or ground mobile applications. Newer designs for person portable in a rucksack and cover 20MHz to 6000 MHz. Standard DF antenna models are typically broadband antennas covering frequencies across the communications bands from HF through UHF, or approximately 20 MHz to 3000 MHz. The most common design is a cavity backed annular slot that incorporates ferrite elements for the lower HF frequency range. A significant feature of the annular slot allows all but the top loaded surface of the antenna to be embedded within a mobile or airborne platform providing a covert capability for the ground mobile unit. Because the covert or conformal antenna does not protrude beyond the platform exterior, it offers minimal disturbance of airflow and permits rotary wing aircraft to land in hastily prepared tactical landing zones and fixed wing aircraft to use unimproved landing strips. The annular slot is best suited for mobile operations where the platform provides the necessary ground plane for optimum performance. When conventional fixed installation or other applications require a mast mounted antenna, modifications permit the use of a synthetic ground plane for some antennas. Where these modifications are not feasible, a more traditional balanced dipole array may be recommended. Choose from our 6000 or 8000 series models. Click on images for detailed tech specs. Designed to cover the VHF marine and aircraft bands.